I had my car in for routine maintenance last week, and was given a brand-new model to drive while mine was in the shop. This new car, an updated model of my own, had all the top bells and whistles, including keyless entry. You just put your foot on the brake and push a button. Easy. Yes, it was simple, but it got me to thinking, what’s so inconvenient about a key? Then I took it one step further and started thinking, no way. I want my key. In fact, all women should want a key, and they should have it in their hand as they approach their car or a store in a parking lot. A couple of things bother me about this keyless entry. First, it means a woman only has to have the key near her – say tucked inside the pocket of her jeans or in her purse. Once she gets close to the car, BINGO! the doors unlock. This does not seem safe to me. Sure, it gives her hands-free access, but it gives that to anyone around her as well. Additionally, if those keys aren’t in her hand, they can’t be used as self protection, and she doesn’t have access to the panic button on the key fob. Not good. I recently had the opportunity to drive my daughter’s car, too. Her key folds into the fob. Again, this is convenient for carrying the key in a pocket. It’s not as bad as the keyless entry, but still, it means she can approach the car and unlock it without having the sharp point of the key exposed. After considering this, I’ve advised her to always release the key and carry it in such a way that it could be used if she were approached, attacked, etc. A few years ago, we had a very sad incident occur in our area. A young woman was abducted from a store parking lot in daylight. In her own car she was taken to another location where she was raped and murdered. Any little bit of self protection that could potentially help a woman in such a situation is so important. Ladies, don’t trade convenience for personal safety. Keep your key! And keep it handy. It could do more than start your car. ← You have the power . . . I couldn’t agree more! 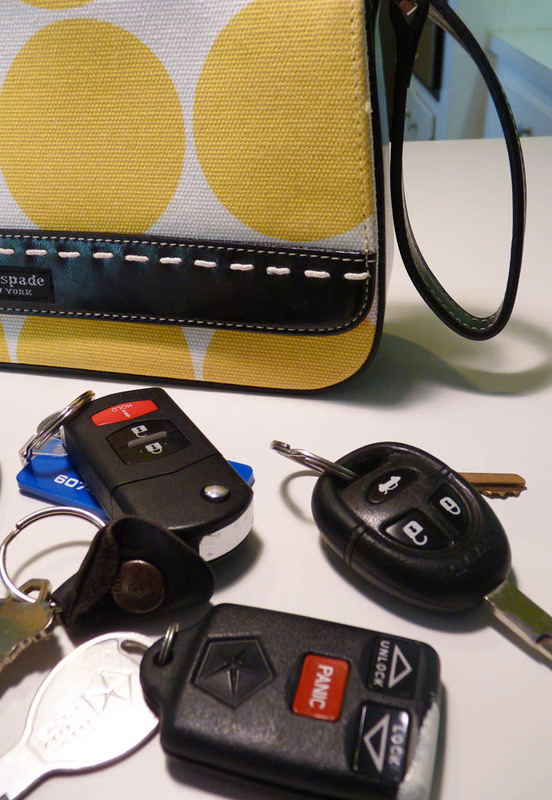 I had a car once with a keypad code and I LOVED that — no one was getting in there besides me! I can understand men not liking keys in their pockets — so maybe it’s time for THEM to make some adjustments. They could carry a nice, masculine shoulder bag for their keys, wallet, sunglasses, lip balm (let’s see, what else does my husband ask me to put in my purse…? ), etc. I know I’ll never buy a keyless car — auto makers need to listen up!